It can take a lot of effort to create a world where a film’s audience believes the world they see is (somewhat) real. To help make this possible, writers and directors turn to real-world experts. 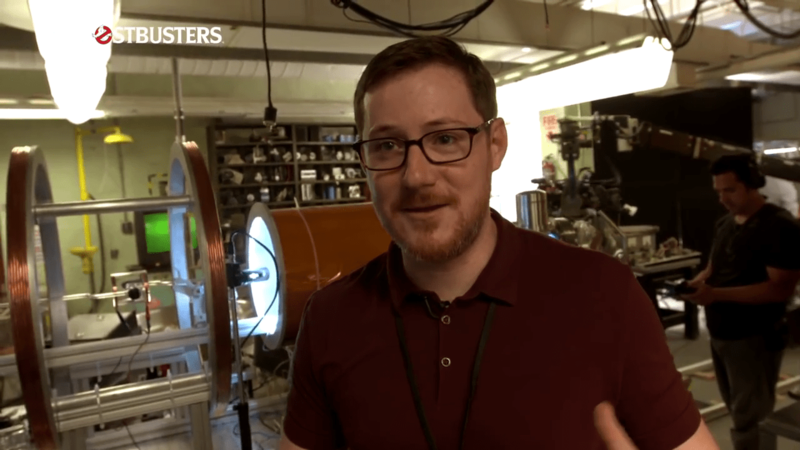 In the case of the Ghostbusters reboot, they turned to Jefferson Laboratories particle physicist, James Maxwell, to get the science behind their props right. In this creators.co article, Maxwell was asked what it was like to work on the Ghostbusters set. Here are some of the things he said. Initially, he thought his involvement would be minor. In fact, when asked by his colleague, Lindley Winslow, to show some film makers around his lab, he thought it was an indie film project. He was very surprised when it turned out the film-makers were from Sony and were working on Ghostbusters. After the team from Sony had seen Maxwell’s lab, they asked him to help them out with some of their prop designs. 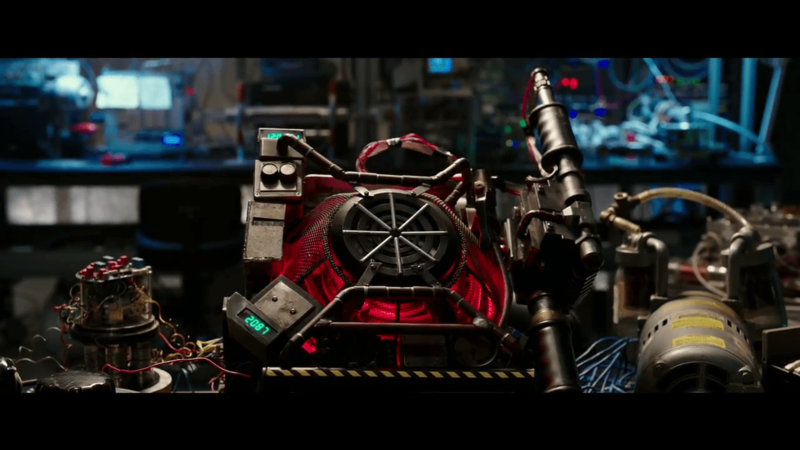 The original Proton Pack used a cyclotron as the particle accelerator. You can see read all about it in a previous article on the science behind the device. Maxwell decided to take the idea, flesh it out, and modernize it. This meant an upgrade from the cyclotron to a synchrotron, a more sophisticated particle accelerator. Essentially, Maxwell broke down how the science would work if one wanted to build a miniature particle accelerator, and this is what we see in the movie. Feig and Dippold seem to have been keen on getting the science “right” according to Maxwell. Maxwell said he would often be asked specific questions and whether something would work. 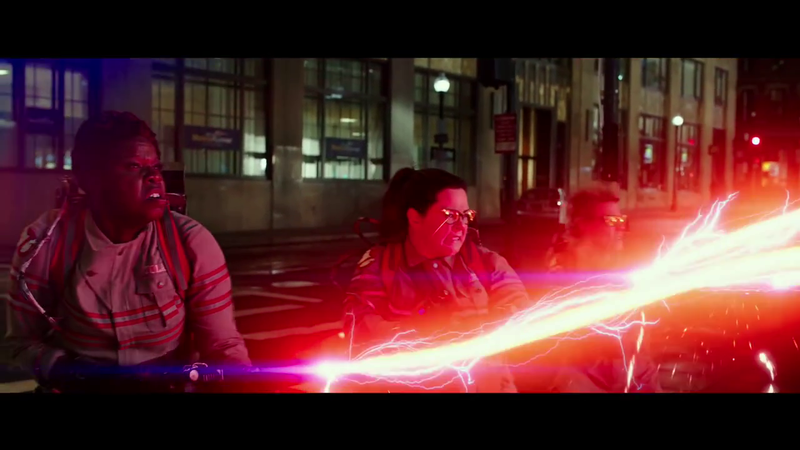 This might include the use of certain materials in the Ghostbusters arsenal. So having role-models is very important and I am happy with Paul Feig sticking with the idea to not only have scientists, but female scientists as role models. This has been the most hated movie trailer of all time! To be fair, there are issues with the trailer itself but, can we really judge a movie by its trailer? Read the article here to find out more about a perticle physicist’s contributions to the movie Ghostbusters. 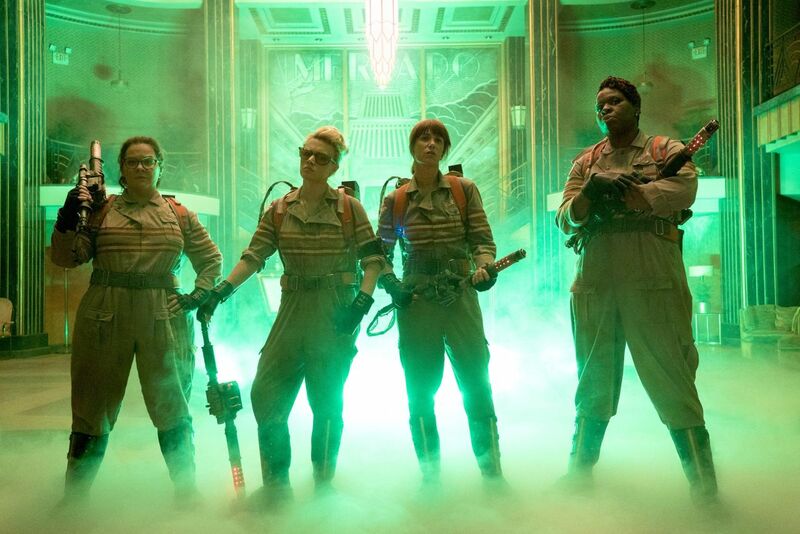 The new Ghostbusters (2016) features a major upgrade to an iconic device: The Proton Pack. In the original movie, the Proton Pack was a portable particle accelerator that emitted a stream of positively-charged protons to ensnare negatively charged spiritual entities. This device was based on one of the earliest particle accelerators: the cyclotron. Basic model of the Proton Pack showing as cyclotron. 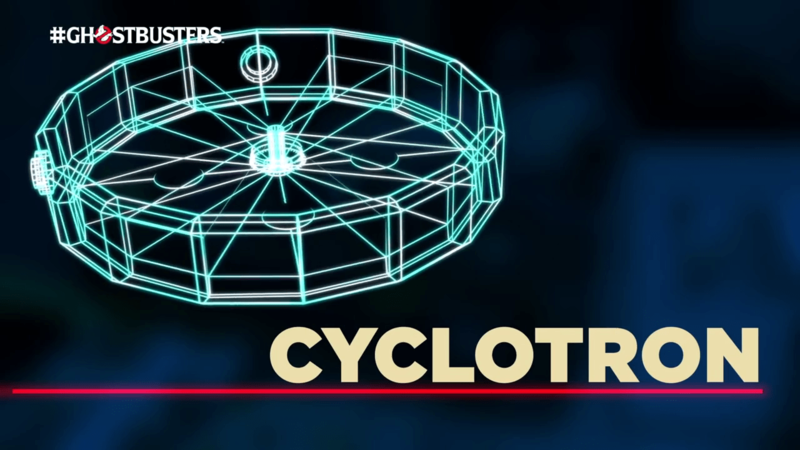 The cyclotron was one of the earliest types of particle accelerators ever developed. Invented by Ernest O. Lawrence in 1932, it works by accelerating charged particles along a spiral path. Inside the cyclotron, a charged particle is injected into the middle of the chamber where it is accelerated between two D-shaped electrodes or “dees.” In the case of the Ghostbusters’ Proton Pack, that charged particle is a positron or positively charged electron. The magnetic field passing through the dees bends the particle’s path, making it travel in a circle, while the electric field between the dees accelerates the particle, giving it a “kick” to make it go faster. When the positron beam has enough energy, it strikes a metal target to release a beam of protons. 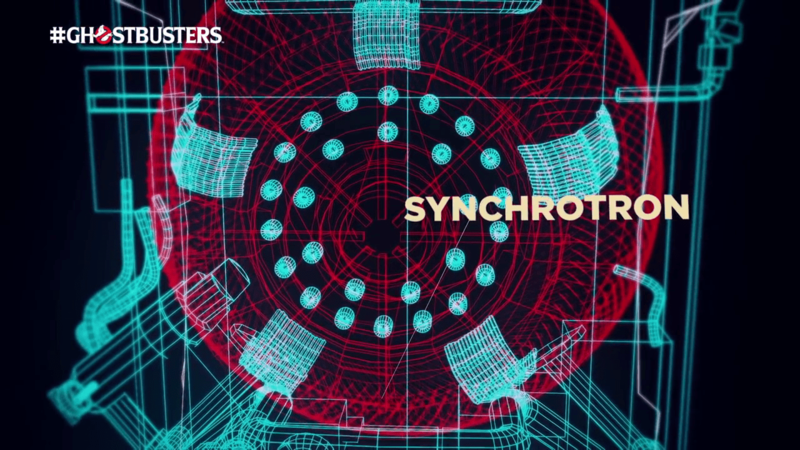 The upgraded Proton Pack is based on the synchrotron. Like the synchrotrons that make up many of the modern-day particle accelerators, this allows for higher energy particle streams. The idea behind the upgrade was due to the movie’s science consultant, and Thomas Jefferson National Accelerator Facility particle physicist, James Maxwell. The movie’s writers, Paul Feig and Katie Dippold have put considerable effort into getting the science right. It is definitely worth a look at the science behind the Proton Pack. Article: The Science of The Ghostbuster’s Proton Pack. Flying West or East. Why is one faster? In his Minute Physics video, Henry Reich looks at the somewhat paradoxical question of why is it faster to fly west than east. Given that the Earth rotates from west to east, we expect that a plane flying west would get to its destination faster as their destination is moving towards them. Think the person or place you are running to is also moving towards you–the relative speed increases. This does not happen. Instead, planes take longer traveling west along the same route. The speeds add when the plane travels to the East (left) but they subtract when the plane travels West (right). The answer to this question lies in the Earth’s rotation. Reich explains that as the Earth rotates, everything rotates along with it at a speed of 1180 km/h along the Equator. This includes the objects on the ground, as well as the air above. A plane generates lift by moving relative to the air around it, and most planes can travel anywhere between 500 to 900 km/h. This means that an airplane traveling East, along the Earth’s rotation, will travel faster because their speeds add. In this case, the plane is traveling 1180 km/h + 500 km/h = 1680 km/h relative to the ground. If the plane travels in the opposite direction, the speed relative to the ground is less because we subtract the speeds — 1180 km/h – 500 km/h = 680 km/h. We do this because we must take the directions that the Earth and the planes move. In Physics, we know this as vector addition. Of course, that is the simple answer, and as Reich illustrates in his video, there is far more to the answer. The fact that the air moves, either pushing a plane along or pushing against it, has everything to do with the Earth’s rotation. The prevailing direction of these winds or the jet stream is due to the Coriolis Effect, the apparent deflection of the winds is due to the fact that the Earth rotates. This means that airplane travel times are influenced by the Earth’s rotation. The reason is not as straightforward as we would like. 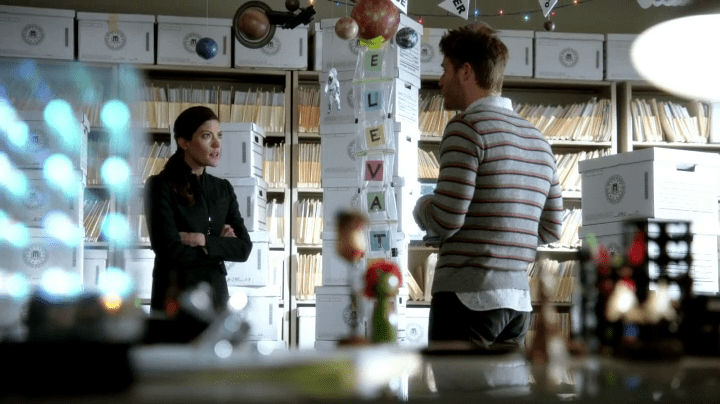 Brian Finch (Jake McDorman) explains the space elevator to Rebecca Harris (Jennifer Carpenter). Building an elevator to space is not entirely new–the idea has been proposed as far back as 1895. Russian rocket scientist, Konstantin Tsiolkovsky, first came up with the idea in his manuscript Speculations about Earth and Sky and on Vesta. But why would anyone want to build such a structure? Not only would it extend all the way into space, it will be the tallest structure on the planet. To say there are technical challenges is an understatement. To put somethings in perspective, Mt. Everest’s height is 8.8 km (5.5 mi) above sea-level, and a Boeing 747 can cruise at an altitude of 12.2 km (7.6 mi). A space elevator is expected to reach an altitude of 35,790 kilometers (22,239 miles), the height of geostationary orbit. Finding the right material to build a space elevator is going to be difficult. 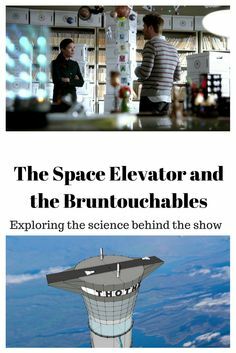 There are many advantages to building a space elevator. The present way of using rockets is very inefficient. Rockets ascent by expelling hot gases at high speeds to leave the Earth’s atmosphere. While travelling at high speeds, the rocket loses kinetic energy to atmospheric drag. If we could lift a payload slowly, it would encounter less drag and lose less kinetic energy as it ascends the Earth’s atmosphere. It costs NASA more than $10,000 per kilogram to send payload into low Earth orbit, altitudes of about 200-2,000 km. 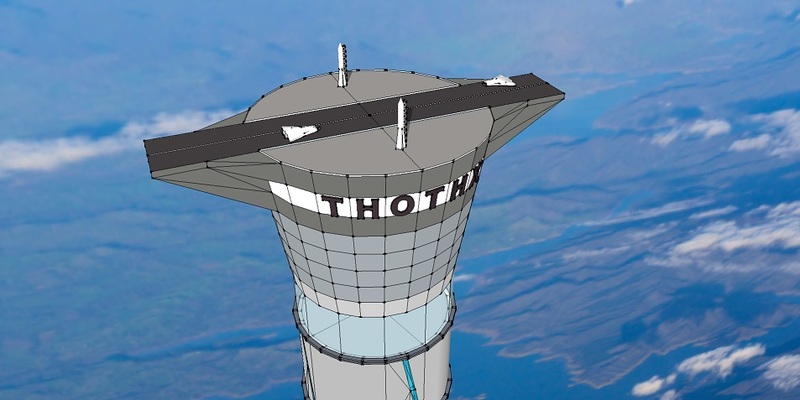 A space elevator will do this cheaper, safer, and more efficiently. Artist depiction of a space elevator. In the Limitless episode, “Headquarters!” Brian Finch tracks down one of the criminals on the FBI’s Most Wanted List. The alleged criminal, Lawrence Drake (Isiah Withlock, Jr.), is also the inventor of an inflatable space elevator. So how much of this is science fiction, and how much did the show get right? Read my article on Science vs. Hollywood to find out. Invisibility is just one of the many features of Kiera Cameron‘s (Rachel Nichols) City Protective Services (CPS) uniform. A cloaking device, such as the one used by CPS officers, deflects light around it rendering it invisible. Such a device would be based on metamaterials; an artificial material specifically engineered to have properties not be found in nature. 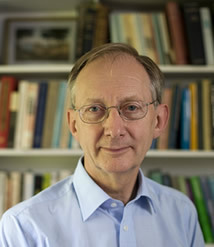 Prof. Sir John Pendry, the father of metamaterials. The idea for such a material was first proposed by English physicist, Sir John Pendry in 2006 in a paper published in Science, “Controlling Electromagnetic Fields”. In this paper, Pendry describes how electromagnetic fields can be redirected around an object thereby rendering it invisible. The way a material affects light is largely determined by its chemical composition. A metamaterial is different because its properties are derived from its physical structure; there are repeating microscopic patterns on the surface. Scientists can engineer this structure to bend light around an object thereby rendering it invisible. Becoming invisible has always been an important part of military strategy since the 18th century and the emergence of the long-range rifle. Soldiers would camouflage themselves by either dressing in forest green or field grey. 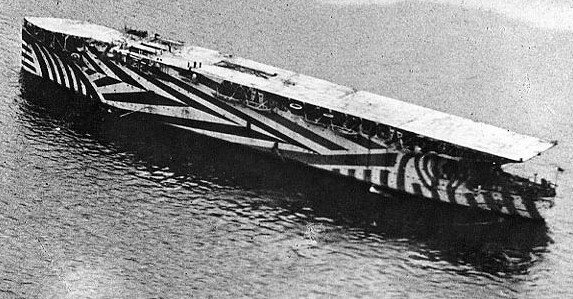 During World War I, troops started to experiment with “dazzle camouflage”. The striped pattern of the dazzle camouflage is a poor choice to hide something as it draws attention to a person or an object. The pattern does have one advantage–it makes it difficult to estimate an enemy’s range. This concept was soon used on ships as it made it difficult for an observer to know exactly whether the stern or the bow was or whether the ship was moving towards or away from an observer’s position. Dazzle camouflage continued to be used until World War II but its effectiveness was severely limited with the introduction of radar. The Germans sought to hide their craft with the use of radar-absorbing materials, the earliest of which was used on submarine periscopes and consisted of a layered coating of graphite particles and other semiconducting materials embedded in a rubber matrix. This material was effective at reducing reflections in the 20 cm radar band range used by the Allies. 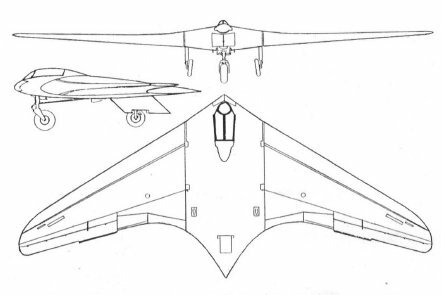 The Horten Ho’s flying wing design made it the first stealth aircraft. The Germans went further by incorporating carbon-impregnated plywood in the Horten Ho 229–the first ever pure flying wing powered by jet engines. It was believed that the carbon powder in the glue would shield the aircraft from detection by the British early warning ground-based radar, known as Chain Home. Carbon is a cheap material with low conductivity. This makes it possible tailor conductivity from synthetic materials made from the element. Conductivity can be very poor (if made from insulated grains of carbon black or soot) or very high (if made from connected chains of graphite). When an electric field encounters a carbon-based absorber, it induces electrical currents in the material which are then dissipated as heat. The hint that a material’s shape and structure at the nanoscale could affect its properties came in the 1990s. The British company, Marconi Materials Technology manufactured a carbon material capable of hiding battleships from radar but had no idea how it worked. They approached John Pendry to find the answer. Pendry discovered the electrical properties that allowed the material to absorb radiation didn’t come from the carbon itself but from the shape of its long thin fibers. This was a significant discovery. Instead of changing a material’s chemistry to alter its behavior, scientists could alter the internal structure at very fine scales–smaller than a wavelength of light–to get the same effect. All electromagnetic radiation has two components: a magnetic field and an electric field. As an electromagnetic wave strikes a material the atoms respond like a tiny magnet–its electrons move in a circle in response to the magnetic component and back and forth in response to the electrical component. 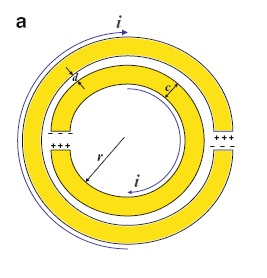 Each split-ring is designed to respond to the electromagnetic field in a certain way. When put together in an array with other split-rings, the periodic construction of many of these cells interacts with the electromagnetic wave as if these were homogeneous materials. This is similar to how light interacts with everyday materials, e.g. glass. We can also create a magnetic field by looping a current around a circle. This magnetic field is more concentrated in the center of the loop than outside. Pendry hypothesized that by creating loops of a non-magnetic material, such as copper, he could create a similar magnetic response typically found in magnetic materials. Scientists would be able to tune how electrons move by tuning the size and shape of these loops. This controls how incoming radiation is bent when it encounters an object. Pendry wondered how far this new insight could go. Would it be possible to change the magnetic properties of a material by simply changing its fine structure alone and not its chemistry? If so, then a theoretical non-magnetic metamaterial could mimic some of the properties of a magnetic substance like iron. A split-ring resonator array constructed using copper split-ring resonatorss and wires mounted sheets of fiberglass circuit boards. The copper rings respond to the magnetic component while the mounted wires respond to the electroc field of an EM wave. Pendry thought of taking this a step further. By cutting the loops, he created what is known as a magnetic resonator that acts like a switch. This switch would allow him to change a metamaterial’s magnetic properties on command. In so doing, by combining what he learned from Marconi’s radar absorbing material he figured a way to manipulate electromagnetic radiation. This makes invisibility possible for Continuum’s CPS officers. An example how an object appears invisible using mirrors. Invisibility can be considered the supreme form of camouflage as it does not reveal anything about an object to an observer. 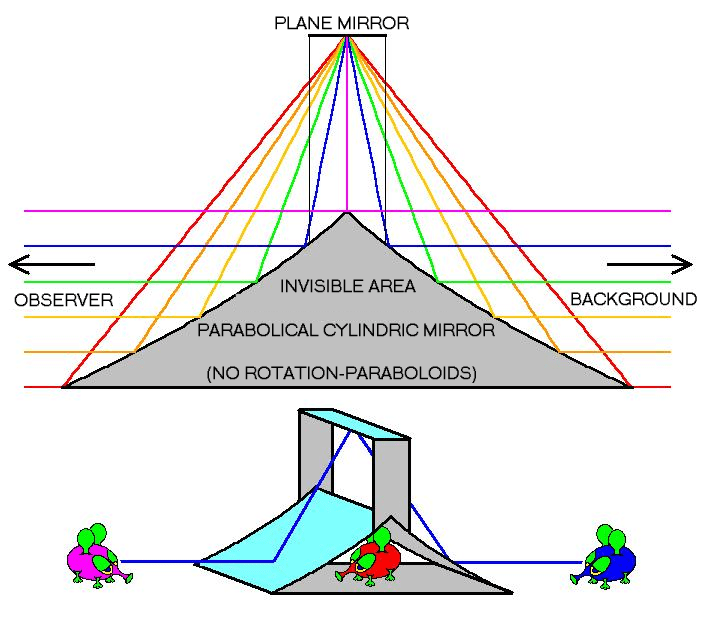 We can accomplish this using a plane mirror and two parabolic mirrors to reflect light around an object. The object becomes invisible from two sides. Metamaterials make an object invisible by bending light around it. (Image from Pendry et.. al. Science (2006): 1780-1782). The fishnet metamaterial could one day become the invisibility cloak of the future. One way of accomplishing this is to create a “fishnet”. In this case the metamaterial is made of alternating sheets of glass and silver containing rectangular holes. This design was developed in 2008 at the University of California Berkeley. As light travels through the fishnet, the alternating layers bend light in unusual ways. The research group at Berkeley hope that this array will eventually be able to guide visible light around an object. The use of metamaterials extend beyond manipulating the electromagnetic spectrum. It can also be used to create acoustic and tactile cloaks, preventing a user from being heard or felt. The acoustic cloak is made from perforated plastic sheets arranged in a pyramid. When it is placed over an object, sound waves act as if nothing is there, as if there was only a flat surface in their path. The sound cloak is made of perforated plastic sheets in a periodic pattern. The acoustic cloak alters a sound’s path in the same way the invisibility cloak does. Sound doesn’t penetrate into the pyramid but is rerouted in a way to create the impression that noting is there. While it may one day be possible to completely hide future CPS officers in the visible spectrum and from being detected by sonar, what happens when they bump into something or, per chance, someone bumps into them? Metamaterials can also be designed to create a mechanical cloak. 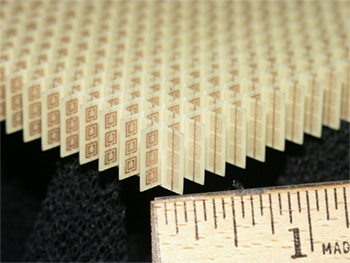 Metamaterials prevent the object at the bottom from being felt. Like the acoustic invisibility cloak, the tactile cloak is made from a periodic polymer array, the properties of which are determined by its special structure. AN object placed under a blanket or layers of foam would still be felt under the blanket. When an object is placed under this “cloak” it redirects stress in such a way that its shape can’t be felt when the cloak is touched. The CPS Invisibility Suit: Is it possible? The fishnet design has the advantage that it can handle a wide range of wavelengths; previous designs could only cloak at a specific wavelength.There are some disadvantages, however. It only works on flat surfaces and not the sleek CPS uniform we see Kiera wearing. There is another limitation to wearing an invisible CPS uniform: an officer won’t be able to see out for the same reason you can’t see in. While the suit is invisible in a certain range of wavelengths–the visible spectrum–it is visible in other areas of the spectrum. We know that a CPS officer’s cybernetic visual implants allow them to see in other parts of the spectrum, in the infra-red and possibly ultraviolet range. In a previous article, we discuss this ability may be based on graphene contact lens, a hexagonal mesh of carbon atoms. A CPS officer can activate their visual implants to see in other parts of the spectrum when they turn invisible. We can only imagine what tech is hidden in Kiera’s CPS uniform. Though she has revealed some of her suits abilities to us we can only imagine what more she can do. Continuum’s present timeline seems to be littered with objects from the future. This is hardly surprising considering it is a time travel show. Objects like Kiera’s CMR, the Quantum Time Traveling Device, the drug Retrievanol better known as “Flash” and that other mysterious device whose purpose we are yet to learn all exist in a time when they should not as they have not been created. Alec Sadler (Erik Knudsen) is arguably the inventor of many of these devices. Or, at least, he will be in the future. If present day Alec “invents” these devices by examining them, can he lay claim to their invention? It really comes down to, did he do the work necessary to bring those ideas to fruition? The answer is more complex than you would think and poses some serious problems in physics. This problem is known as the bootstrap paradox. 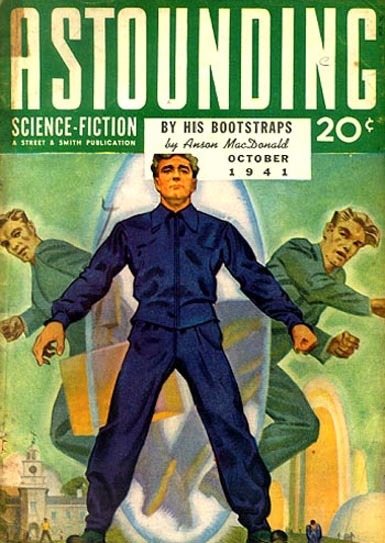 “By His Bootstraps” by Robert A. Heinlein was originally published in the October 1941 issue of Astounding Science Fiction under the pen name Anson MacDonald. The bootstrap paradox is a time travel paradox in which an object or information can exist without ever being created. The object or piece of information is sent back in time where it is retrieved and to become the very object or piece of information that was brought back in the beginning. One example would be a famous author who goes back in time to give his collected best-selling works to his younger self. His younger self sells those works to a publisher and becomes famous. The now older author then goes back in time to give his manuscript to his younger self. The term originates from the expression “pulling yourself up by your bootstraps” and was used to describe the time-travel paradox in Robert A. Heinlein’s story “By His Bootstraps”. In Heinlein’s story the protagonist, Bob Wilson, recreates a notebook of translations belonging to his future self. At the end of the story, he wonders who actually compiled the notebook as he prepares to give the book to his younger self in the past. The young and future best-selling author may feel nothing is wrong with this but to some of us, it seems as if he is cheating. Though it can be argued that the young author, left on his own, will eventually produce the work that he becomes famous for, he has not yet created that work. He is not just claiming ownership for something he never worked on but copying it. This is why it seems like cheating. All of the author’s best selling work and Bob Wilson’s notebook of translations have no point of origin because no one has actually created any of it. It all exists in an endless time-loop. As matter and information can not exist without being created, it is paradoxical that it would exist inside the loop. This becomes even more difficult to consider when we consider physical objects. The Second Law of Thermodynamics states that entropy increases over time meaning that any object brought back ages, will eventually break down and decay. This means that no object will be the same when brought back and can not become the same object in the future. A time loop also poses a problem with determinism. As every action must occur in exactly the same way each time for the loop to exist. No one can act in a way to do something different. There is no free will in this scenario. Head Frelancer Catherine explains the nature of time in Continuum. Though it seems that the laws of physics conspires against young Alec to prevent him from taking advantage of his older self’s work and inventions, it doesn’t. 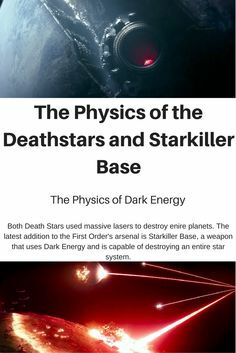 At least not in the way we understand the show’s physics. We know at the start of Season Three that time is not immutable. It can change depending on a person’s actions to not only give rise to new branches but to eliminate old ones. This branching timeline idea means that both objects and information can travel between timelines thus resolving the paradox. In an original timeline, Alec Sadler, played by William B. Davis, was the genius that created the inventions of the late 21st century. All the inventions that Alec creates now have a point of origin or creation. It’s just in another timeline. When someone travels back in time, they can bring any objects or information with them and create a new timeline. This means that a younger Alec can use information from an alternate future to recreate technology in his own time line without violating any laws of physics. He can, for example, use information from Jason and dead Kiera’s CMR to recreate his medical monitoring wrist band, Halo. Multiple timeline also solves the problem of determinism. In a loop, everyone must continually do everything that happened before without deviation and with no apparent free will. A new timeline means people’s choices will shape the outcome and events in the future. In “Minute of Silence”, (Season 3, Episode 9), Carlos Fonnegra (Victor Webster) shows Alec the dead Kiera frozen on ice. “You and me. We’re originals,” he tells Alec. But are they? It’s not surprising that Carlos would make such a statement or even think it. We all like to think we are original or special in some way. In reality, neither he nor this timeline’s Alec are originals. They are just copies. In A.J. Bond’s time traveling short story, Hirsute, a young time traveler tries in vain to solve the problem of time travel. Deciding that if a solution exists, he will simply go back in time and give himself the answer. To his surprise, nothing happens. No one comes to visit. Maybe time travel is impossible. The next scene replays exactly as before but this time someone comes back with the answer. Excited to see his older time traveling self, the young physicist claims a victory. Or tries to. His older time traveling self tells him that he did nothing and hasn’t invented time travel. The older and hairless time traveler is the original. So as much as Carlos would like to believe that he is the original and not some copy, he is wrong. I wonder who is going to break it to him. In the 2014 Godzilla reboot, Dr. Joe Brody discovers that the M.U.T.O. (Massive Unidentified Terrestrial Organism) may be using a form of echolocation to communicate with another of its kind hidden in the Yucca Mountain Nuclear Waste Depository in Nevada. How exactly can a creature in Japan communicate with another all the way in Nevada? It uses ultrasound. To learn more, read my new MoviePilot article. 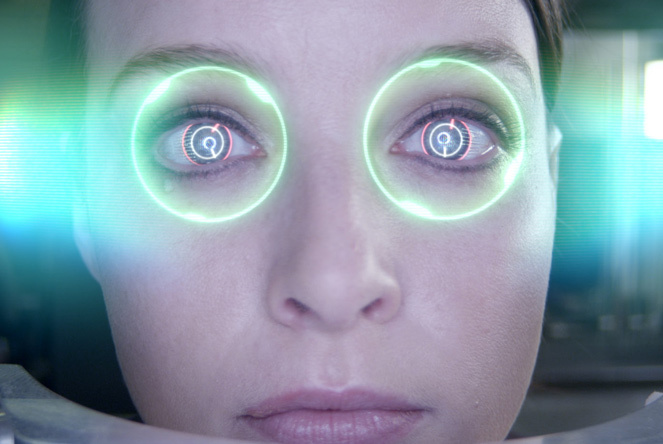 Cybernetic visual implants allows Kiera to see in low light levels to capture a killer. 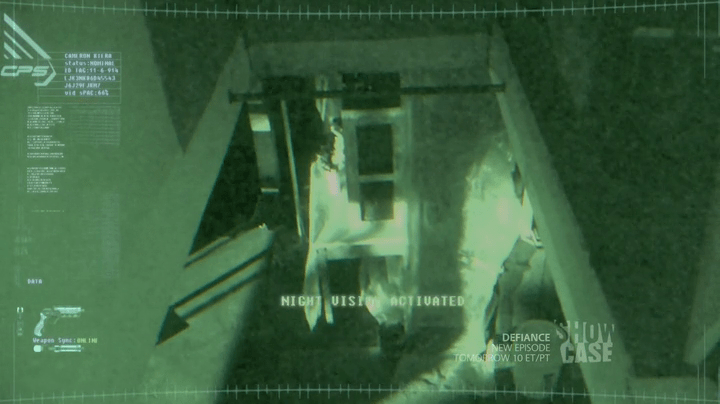 We also see a further use of Kiera’s night vision capabilities in the episode “Minute of Silence”. Both Kiera and Carlos (Victor Webster) track a high-tech free running thief who has stolen an invisibility cloak from Hyper Stealth. Though invisible to visible light, Kiera’s CMR picks up the thief’s heat signature and she and Carlos are able to make a quick arrest. While the invisibility cloak may bend visible light and make our thief invisible, it doesn’t do the same for infrared. Night vision isn’t exactly new. It has been used by the military as far back as World War II. Present day night vision devices look like binoculars strapped onto a soldier’s helmet; not like Kiera’s cybernetic visual implants which have been neatly implanted onto her eyes. A device like this may not be that far off in the future. Engineers from the University of Michigan have built and tested a broadband photodetector using graphene, a honeycomb lattice of carbon atoms that is just one atom thick. Their findings was published in 2014 in the prestigious journal Nature Nanotechnology. The study’s authors hope this will one day lead to night vision contact lens. 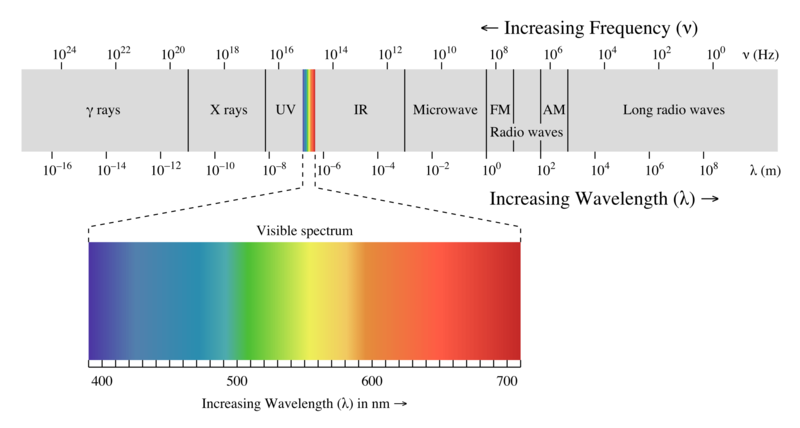 Spectrum showing the visible portion of light. This accounts for a very small portion of the entire spectrum. It should come as no surprise that many animals have better night vision than humans do. They can either see a much wider range of the light spectrum or see at much lower light levels than we do. Humans, instead, use technology to improve upon what nature hasn’t given us. This works in one of two ways: either by image enhancement or by thermal imaging. In image enhancement, low light levels, that are imperceptible to our eyes, are amplified to a point where we can observe an image. In thermal imaging, the infrared part of the spectrum is captured with an infrared detector and converted into visible light to produce an image. 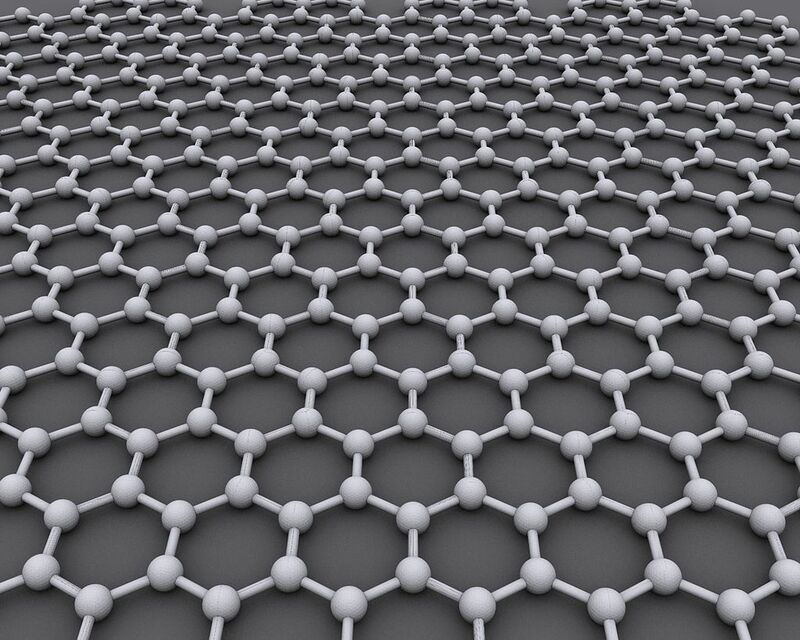 Graphene is an atomic-scale monolayer honeycomb lattice made of carbon atoms. A futuristic science fiction device could be based on nanotechnology and made using graphene, a sheet of carbon that is just one atom thick. The carbon atoms form strong covalent bonds and are arranged in a hexagonal shape. This gives graphene unparalleled strength not seen in most materials; its breaking strength is over 100 times greater than a hypothetical steel film of the same thickness. 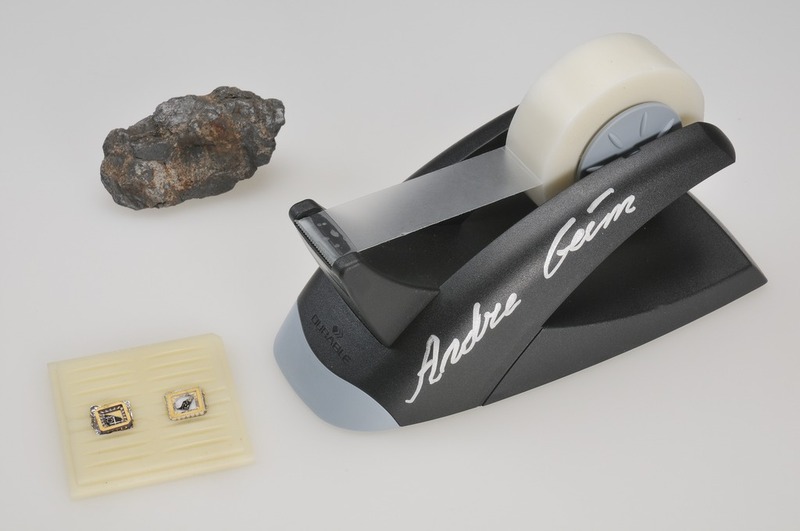 A lump of graphite, a graphene transistor and a tape dispenser. Donated to the Nobel Museum in Stockholm by Andre Geim and Konstantin Novoselov in 2010. The material was discovered in 2004 by two University of Manchester physicists, Andre Geim and Kostya Novoselov. The two scientist pulled tiny bits of graphene from a lump of graphite, the same material found in a “lead” pencil, by sandwiching a graphite flake between some Scotch Tape. The tape layers was pulled apart to separate the atomic layers. They continued this process several times until a single atomic layer was left on the Scotch Tape. Photograph of graphene in transmitted light. This one-atom-thick crystal can be seen with the naked eye because it absorbs approximately 2.3% of white light. What may come as a surprise to the average non-scientist is that no special equipment is needed to view this single atomic layer of carbon atoms. Graphene is considerable opaque considering it’s only one atom thick. 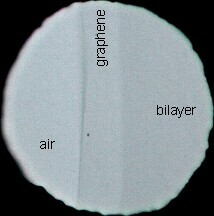 The layer absorbs 2.3% of the light incident on it making it very easy to see with the naked eye. If this 2.3% doesn’t sound impressive, that is because it really isn’t. Compared to a material like silicon, which is used to make solar cells, it doesn’t absorb as many photons. However, it does have one advantage over silicon–it has no band gap. The bandgap for insulators, semiconductors and conductors. Band gaps exist in both insulators and semiconductors and is the energy needed to get electrons flowing in either material. Metals conduct easily because their valence and conduction bands overlap and require no additional energy to get them moving. Semiconductors can get this energy from light. If a photon with enough energy strikes the surface of a semiconductor, it knocks and electron loose and the material starts conducting. If there isn’t enough then it remains an insulator. If a photon has more energy than the required amount, then the extra energy is lost unless it has twice the energy of the band gap. In this case the photon will liberate two electrons. This is the reason why, under ideal conditions, the silicon based solar cells maximum efficiency is about 30%; they can only absorb photons with energy in a tiny range. Graphene has, what is known as, a zero band gap which means they can absorb photons of all energies. So while it doesn’t absorb as many photons as silicon, it makes better use of the much wider range of photons that it does absorb. This is of considerable interest to scientists as they could become highly efficient solar cells. Kiera Cameron’s Cellular Memory Review being installed during her first day as a Protector for the City Protective Services. Kiera’s cybernetic visual implants form part of her CMR or cellular memory review. The CMR is based on a liquid chip technology that interfaces with the visual implants to give users a Heads-Up Display. The visual implants also allow its users to see beyond the visual range, to detect infra-red radiation and see in low light conditions. Present day night vision devices are clunky. Devices that can see in the low-IR region typically requires detectors to be cryogenically cooled to reduce their atom’s thermal vibrations as much as possible. Neither of these characteristics are ideal for the future of law enforcement. Future City Protective Services’ (CPS) Protectors will need to carry liquid-nitrogen cryogenic backpacks for their visual implants to work effectively. Graphene may solve this problem as it is also able to absorb infra-red photons at room temperature. The problem is that it doesn’t absorb a whole lot of infra-red photons. Its sensitivity is about one hundred to one thousand times lower than any commercial device on the market; any signal it produces will be too weak to produce an image. 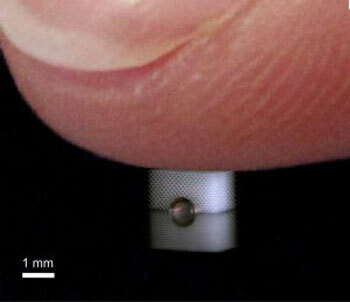 Researchers at the University of Michigan, led by Zhaohui Zhong, have found a way to capture and amplify the signal into a device smaller than a pinky nail. An insulating layer is sandwiched between two sheets of graphene to create an optical transistor. 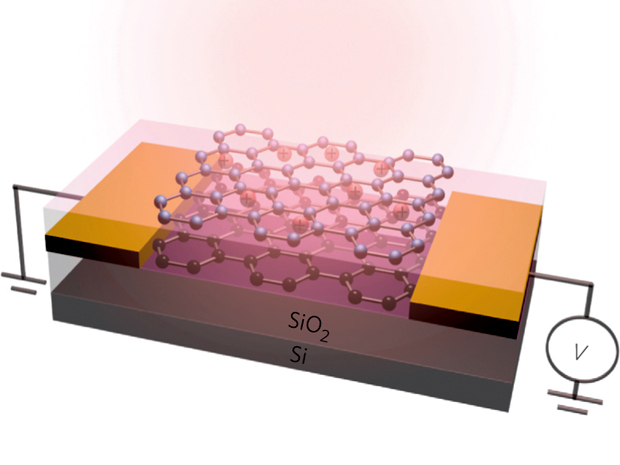 The IR detector is created by sandwiching an insulating layer between two sheets of graphene. A tiny electrical current runs through the bottom sheet. Electrons are released as infrared photons strike the top graphene layer. These free electrons quantum tunnel through the insulating layer where changes in current flow in the bottom layer is measured and observed. Zhong and his team were able to use this to determine the brightness of light striking the upper layer and create a viable method of detecting infra-red radiation in something that could, one day, fit inside a contact lens. We have seen Kiera monitor physiological function and identify chemicals using her CMR. This graphene-based device could also, one day, go beyond military and law-enforcement applications to use IR-wavelengths to monitor blood flow as well as identify chemicals from their heat signature. Could the tech we see on Continuum become a part of wearable electronics that will expand our vision and provide us with another way to work and interact with our environment? There is nothing as intimidating or awe-inspiring as the most famous Kaiju’s roar. Though fictional, this is one of the things that defines him other than his massive size. But there are problems were physics is concerned. Sound is generated by the larynx in one of two ways: either purring mode or flow-driven mode. Purring mode depends on how quickly the vocal folds or vocal cords contract and vibrate. Flow-driven mode depends on how passing air vibrates those folds. The sound produced in flow-driven mode depends on the size of the larynx. The larger the larynx, and hence the vocal folds, the lower the sound. 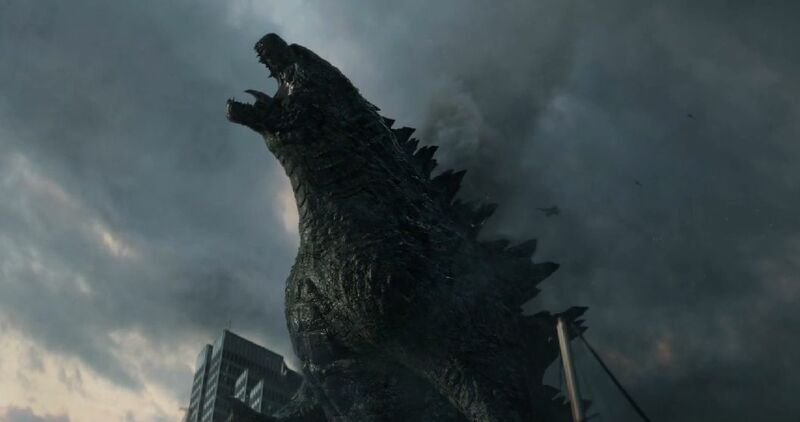 Godzilla is so large, his roar would be in the infrasonic range; below the range of human hearing. Purring mode suffers from no such limitation. Could the King of Monsters actually be purring? Read my MoviePilot article to learn more. In addition to time travel, Continuum also looks at how advance neurotechnologies, in the form of mind control and cyborgs, might affect society. In Season Three’s episode, “Minute to Win It” we see Lucas Ingram (Omari Newton) use his scientific wizardry to hack the brains and take control of a few cockroaches and a dog to break out of prison using nothing more than homemade electronic devices. MacGyver would be proud. Discoid cockroach with the Roboroach control backpack can be brought from Backyard Brians. This shouldn’t come as a surprise to fans as Lucas once designed mind control weapons for SadTech. 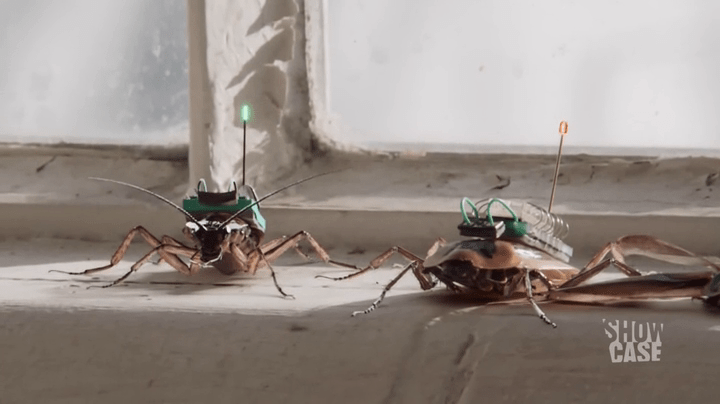 What may surprise fans is that the science behind creating these cyborg roaches is real. The roboroach kit can be brought online from the Backyard Brains website. You can even control your roboroach with an Android app. Of course, controlling insects is much easier than controlling a dog or even a human. Continuum takes everything further by examining the type of society we would live in if mind control was possible. We should also ask the even more important questions–is this is possible and should we be afraid? The word “cyborg” is an abbreviation of cybernetic organism and is defined as an organism with biological and abiotic or non-living parts. First coined in 1960 by Manfred Clynes and Nathan S. Kline in the Astronautics article “Cyborgs and Space”, the two scientists believed that self-regulating human-machine systems would one day free man to explore space. Information is transmitted electrochemically through the body via neurons, the basic building block of the nervous system. Cockroaches have neurons like ours but unlike us, cockroaches have much fewer neurons–about one million compared to our one hundred billion. This difference in numbers allow humans to think about the world around us, control roboroaches and ponder the paradoxes of time travel. Cockroaches are different from us in that they also have a decentralized nervous system with ganglia or clusters of neurons running down its body. 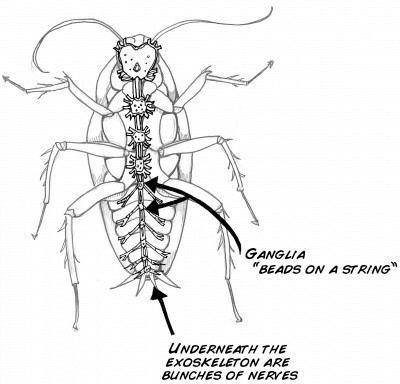 A cockroach as a large ganglia in its head and, for all intents and purposes, it can be considered the organism’s brain. This decentralized structure means that a cockroach’s brain doesn’t play the same important role that ours does. In fact, a cockroach can live for several days without a head. Decapitated cockroaches can even survive for several weeks if the decapitated wound is sealed with dental wax to prevent dehydration. This decentralized system means that in the absence of its head, the other ganglia can take over and process information. 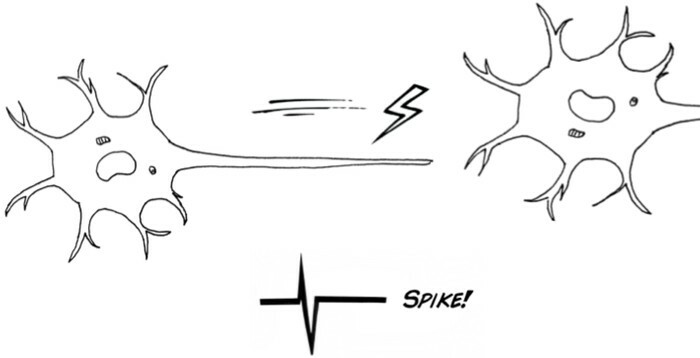 Even though our nervous system is different from a cockroach, the structure and function of the individual neurons are similar–controlling cockroaches is thus possible because cockroaches have neurons like ours. A cockroach’s two antenna help it navigate the world through its senses of touch and smell. Tiny hairlike sensors cover the cockroach’s antenna that connect directly to neurons and send signals to the roach’s brain. Cockroaches have evolved very quick escape responses. If they sense stimulus on one antenna, either from a direct touch or a gust of wind, the creature darts away in the opposite direction. 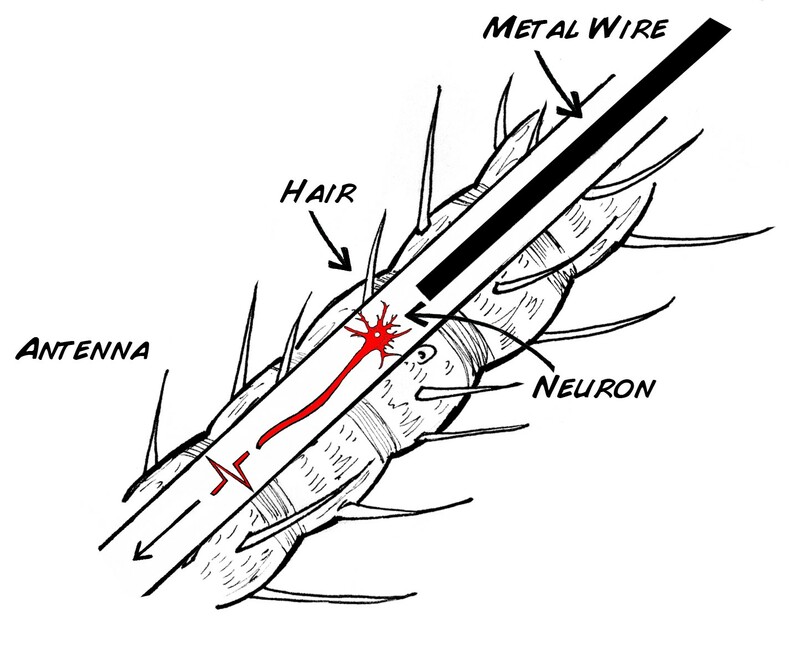 By implanting electrodes that are thinner than a human hair into the cockroach’s antenna, we create a neural interface. These electrical wires send electrical signals that match the signal from the hairlike sensors. Sending a signal to a roboroach’s right antenna “feels” the same as if that antenna was stimulated by a gust of wind or the touch of an object which sends the creature scuttling to the left. 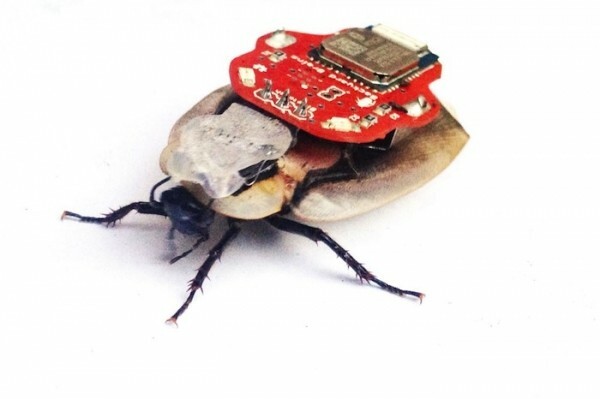 Though we may not think of Lucas’ cockroaches as cyborgs, that is exactly what they are. By directly stimulating the creature’s neurons we can control the direction it goes. This type of direct neural interface used to control roboroaches was invented in the early 1970s and is used by scientists and doctors to learn about our nervous system and treat people who have lost critical biological functions. There are some really good reasons to create cyborg roaches. Cockroaches have evolved to explore and navigate confined spaces to search for food and escape predators. These abilities are ideal for search-and-rescue operations in the event of a major disaster. Instead of designing or building a mechanical roach of our own, which takes time as we also have to understand the physics of cockroach locomotion before we can actually build a robot, we can just control what nature has already created. Just be careful. If you, one day, find yourself trapped under rubble, that cockroach you want to crush may be your savior. The type of neural interface used to control roboroaches can also help us better understand our own brains and how our neurons work; they may one day treat and cure diseases. In 2011, Sloan Churman, a young woman who was deaf from birth was able to hear for the first time in her life at the age of 29 with an Esteem cochlea implant offered by the Envoy Medical Corporation. Though may seem that the Backyard Brains Roboroach kit is some evil device designed to circumvent a cockroach’s “free will”, it doesn’t–it just mimics the sensations a roach experiences. This is similar to the bridle on a horse. Pulling the reins left or right controls the horse’s head and the direction the rider wants to go. In the same way, sending an electrical signal to the cockroach’s antenna makes it think there either is an object in its path or it has detected a gust of wind and heads in the opposite direction. Everything about us, who we are, our likes, our dislikes and our memories are all encoded in the billions of neurons inside our brain; your mind is your brain. There isn’t a “switch” that can turn off who we are. New Pemberton worker 22501 whose mind has been wiped for inability to pay for a corporate life debt. Seen in Season 2 Episode 9, “Seconds”. 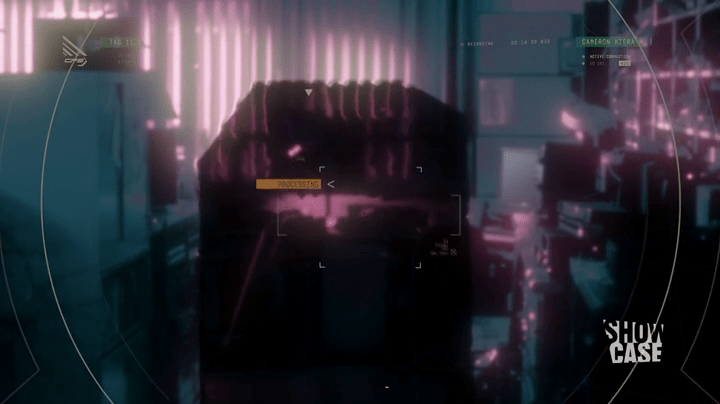 While Continuum’s world of 2077 appears to be capitalistic, it is not. Everyone exists to serve the Corporate Congress and lack the freedom to decide the course of their own lives. Mind control in 2077 becomes a metaphor of that lack of freedom. People’s value to society has been decided from birth and everyone is expected to pay off this “debt”. 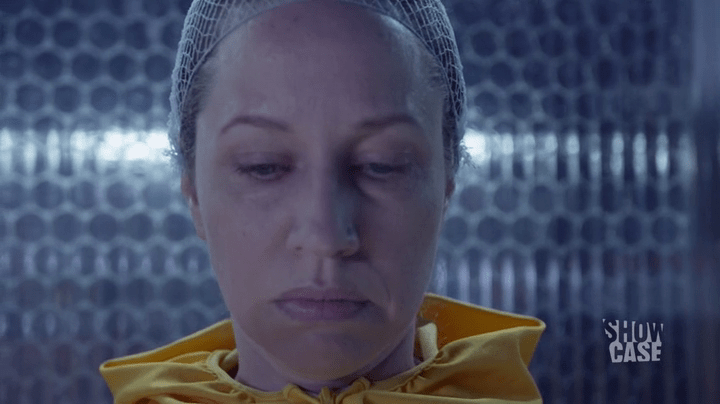 We also see what happens to people who are unable to pay their debts to society in the case of worker 22501 in the season two episode, “Seconds”. Super soldier Stefan Jaworski (Mike Dopud) under mind control to control aggressive tendencies. The show’s premise is that everyone is a slave to the Corporate Congress. Liber8 appears to believe that without self-determination there can be no freedom but we are left to wonder how strongly they believe in that principle. Are they willing to sacrifice those ideals to achieve that freedom for all. We see Liber8 use 2077 mind control technology to control innocent civilians in the episodes “Seconds” and “Minute to Win It”. Does this mean that Liber8 think everyone can be used as pawns in their war against the future and thereby show little regard for individual lives? As much as we would like to believe this is a more violent, “the end justifies the means” Liber8 under the leadership of Travis Verta (Roger Cross) and Sonia Valentine (Lexia Doig), it is not. Mind control in the present was first used in “Playtime” under Edouard Kagame’s (Tony Amendola) leadership. If Liber8’s philosophies are supposed to come from Julian Randol/Theseus (Richard Harmon), we are left wondering how Julian feels about Liber8’s current direction. So far, Julian has pretty much been laying low. Will we see a more central role from this character in future episodes? 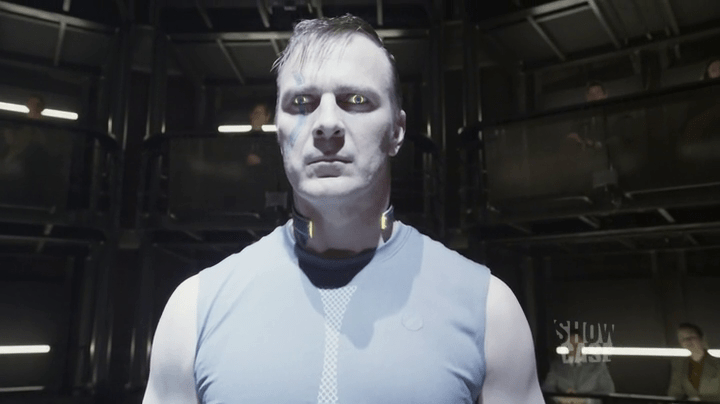 Though Continuum often utilizes real science and technology in its episodes, this is not what leads humanity to the bleak and totalitarian future of 2077–the science of neurotechnology has no power to take away our minds or circumvent free will. The show goes far from saying science is scary. Rather it is people’s choices that leads to this ultimate demise. I am not associated with the Backyard Brains company or website in any way but I believe in their mission to bring the field of neuroscience to students. You should really support them and buy one of their products and learn something really cool. David Latchman on Flying West or East. Why is one faster? Cal rowley on Flying West or East. Why is one faster?